From time to time the Friends make special items available for sale. The Friends are delighted to offer individual copies of many of our annual Cameron Hollyer Memorial Lectures in booklet form. The lectures have been printed each year since 2008 except 2016. Copies are CDN$15.00 to addresses in Canada and US$15.00 to anywhere else, including postage. The script is a condensed version of the 6-part script by Edith Meiser, originally broadcast in the U.S. in 1941 featuring Basil Rathbone and Nigel Bruce and, as far as we know, never heard again since. 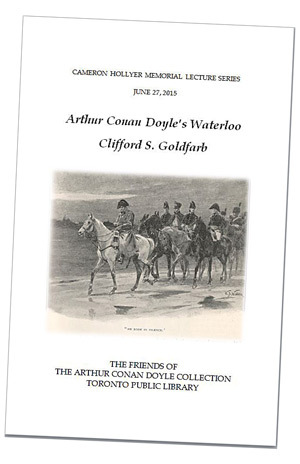 The script was kindly provided by the University of Minnesota and the Friends of the Sherlock Holmes Collections. 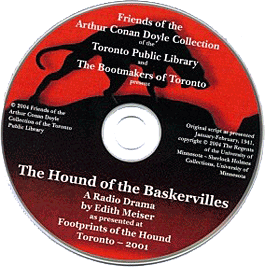 Proceeds of the sale of the CD go to the Arthur Conan Doyle Collection of the Toronto Public Library, and to the University of Minnesota Sherlock Holmes Collections. Payment may be made by VISA, MC, Amex, Canadian or US Cheques - or bank drafts payable to The Friends of the ACD Collection. Other destinations, please contact us for postal rates.